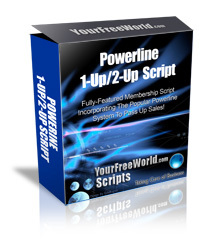 Fully-Featured Membership Script Incorporates The Popular Powerline System To Pass Up Sales! 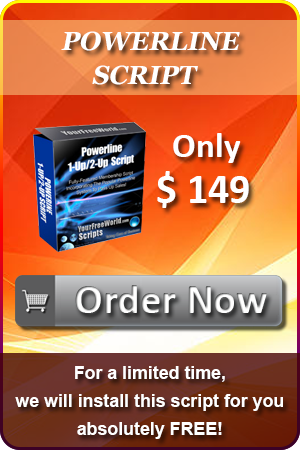 How To Effectively Stay On Top Of The Game With The Latest Greatest Powerline Script! If you've already tried some of our other money-making scripts, or even if you're new to the internet marketing realm, here's a script that will generate extra revenue for you each month. Imagine having your own membership site of paying members that grows with every passing month. If you grow your list to several hundred, and they send you $20 each, you'll be making over $5,000 per month! But not only that, you'll also be growing a list of paying customers that you can send your business opportunities to, and earn even more sales to add to your income. Taking the undeniable popularity of membership sites, and the outstanding income that can be easily generated from profitable powerline systems into account, we've developed a winning combination that you can't ignore. You choose for your members to pass-up the first one or two sales to their referrer, then your members start reaping the rewards for their efforts. We've designed our script with the layman in mind... That means you don't need to be a technical wizard to take advantage of the features. The control panel makes it easy to manage and administer your program, with all the hard work taken care of in advance for you. Once you've setup your powerline membership site, you can be promoting it and earning an income in no time at all! FACT: In this day and age of information marketing, if you don't have at least 1 membership site in your business, then you're leaving unclaimed money on the table for your competitors to snap up! Inexpensive To Start: Membership sites are relatively affordable for most marketers, and quick to setup and start running effectively. You won't be paying out for the monthly hosting of an autoresponder script either... Instead you'll be managing all from your easy-to-access Admin control panel. Multi-Purpose Script: You can install the script on any domain that you own gaining even more value from the script. Earn Passive Income: To be successful, a strong initial effort is needed to get your site running and a passive income stream flowing from the membership fees generated. After that, you may well find yourself earning more on a monthly basis, but working much less than you initially planned. This makes it very easy to duplicate your efforts to other sites should you wish to expand your business exponentially. Expert Status: As your powerline membership grows in popularity, so will your reputation. You will begin to be seen as an expert in your field. Subscribers will automatically look to you for advice, and inherently trust your judgment. Essentially, you will be building and promoting your own brand. When you have a recognized and trusted brand, your new products automatically become trusted as well. Comprehensive Administration: There are many features that you can customise and control from the management area to suit your business. You have the freedom of choice to set the options that you want to offer, and the ability to change settings as required. Built-In Sales Force: By offering an affiliate program, your members will be able to earn income through the referrals they bring to you. If you are consistently providing your customers great content and quality information, they will be happy to tell others about your site. Sell Advertising: An added benefit is that you can sell top and bottom banner impressions across your site to generate extra income. Flexibility: New members can signup to your program in 2 ways; either directly from the sales page, or by opting into your list to receive more information. Opting in gives them the opportunity to signup at a later date when they're satisfied with the information that they've received. Privacy: Your list is on your domain and your customer database is only available to you and no one else, ever. Security: Our script was developed to include better security, so your information is kept safe at all times. Reliability: When you host your own membership script, the service should run more reliably than that of an external paid service, because you are the one who manages the business and has control. Support: If you require support for your script, it is available 24/7 through our support centre. Enhancements: If you require enhancements to your script, it is available through our professional development team at reasonable rates. Wouldn't You Like To Increase Your Income Significantly? Check Out The Features Of Our Fully Functional, Customisable Top Quality Powerline 1-Up/2-Up Script Below! Example sales page template provided so you can quickly generate new customers. You can customise and personalise the copy to suit your company brand. Enter the HTML code for the home page, bonus pages and member's back office. Manage account holders subscribed by search, active, pending and removed. Send an email broadcast to account holders in plain text or HTML format. View ads and banners for affiliates to promote your service. Withdrawl earnings via PayPal, Moneybookers and Payza. As you can see, there are some extra features that you won't normally find in a regular, run-of-the-mill membership script. That and the super user-friendly interface makes our script a winner that users of any experience level will find easy-to-use. Set the program name, site URL, admin email address and admin area login details. Set the number of levels that you wish to pay affiliate commissions to your members. Set your payment ID's for up to 4 online processing companies so you can receive money immediately, and provide your members with many ways to pay. The include PayPal, Moneybookers and Payza. Add up to 5 extra merchant accounts to your program. Select the membership types that you wish to offer, including free, pro or both types. Choose the duration of membership offered, including monthly, yearly or lifetime. Set the price of the pro membership fee, and the minimum withdrawl that must be reached for affiliates to take their earnings. Set the price for site banner advertising per CPM (1000 Impressions) for top and bottom placement. Customise the confirmation and free members welcome email, pro members verification email, verified pro members welcome email, referral notification and banner ad approval emails. Add the HTML code for the free member's bonus page and the pro member's bonus page. Copy and paste the HTML code into the system for the Account Upgrade Thank You, Ad Purchase Thank You, FAQ, Home, Logout, Member's Area Home, and Terms pages. Add/Edit membership level payouts for free and pro member commissions earned. View all details of each member, including signup details, total earned, unpaid balance, and paid amount. Withdrawl details, IP address and date of registration. Edit, delete and upgrade to pro functionality available. View all details as above, plus Admin mailing status. View all details as above, with functionality to downgrade members and renew subscription included. View all members that are waiting to have the verification of their payment made by clicking the approve button. Ability to delete members included. Filter by name, username or email address. See which affiliates are referring the most new members. Choose from plain text or HTML email to all members, free members or pro members. Personalisation fields included, such as first name, full name, username, password, email, IP address, date and sponsor. View members whose subscriptions are due for validation and approval. Add/delete banner URL for your affiliates to promote from the Promotional Center in the member's back office. Add/delete subject and message of solo ads for your affiliates to pormote from the Promotional Center in the member's back office. Personalisation fields include name, username and refurl. View ID, username, payment method, amount and date of withdrawls previously made. View ID, username, payment method, amount, date and action to pay member's affiliate commissions due. Shows details of purchased banner impressions including ID, advertiser info, tracking password, banner with URL, impressions purchased, remaining, hits, date and action. Purchase banners waiting for verification of payment for approval in the system. Allows at-a-glance viewing of Total Number of Members, Free Members, Pro Members, Pending Members, Subscriptions to Renew, Approved Banners, Pending Banners, Paid Money, Pending Withdrawls, Promotional Banners, and Promotional Solo Ads. This Script Comes With FREE Installation!